The Titans volleyball team continues to fall prey to opponents who bring both skills and proficiency to the floor. The young Crested Butte team has the drive, they just need the technical skills to bring their game to another level. Until then, they continue to grind through the season with their young team hoping for greener pastures later this season and in the future. Perry spent a good portion of last week with that in mind as she had her players continue to get as many touches on the ball as possible, all the while working with her middles in particular. “I really just wanted the kids to get as many reps as possible and work with my centers to be more of a force in the middle,” says Perry. 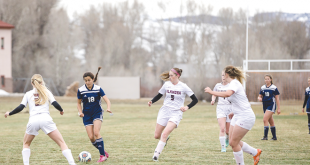 They opened the week of matches on Tuesday against Gunnison. The players admitted they had a rough warm-up prior to the match and that played out during the match as they fell in straight sets. “They told me they had a bad warm-up and I think they psyched themselves out and were nervous about playing Gunnison,” says Perry. They went from the frying pan and into the fire on Friday when they hosted the Sargent Farmers, the top team in their league and one of the top programs in the state. Perry admitted she was not looking for the win against Sargent but knew her girls could at least compete. Unfortunately, they struggled to even do that, falling in straight sets. “Our kids just didn’t really show up against them,” says Perry. Senior Catherine Washburn served up two aces in the match, junior Maisy Ramsey had six kills and Ellia Pannier tallied six digs. Inconsistency then plagued the Titans the next day as they hosted the South Park Burros on Saturday, October 1. After a slow start losing the first set, the Titans won the second set but then dropped the next two to lose the match. “They didn’t show up, then played well but then let the game go,” says Parry. Sophomore Savannah Freeman rose up for six solo blocks in the match, Pannier had eight kills and Stoneberg served up four aces. With October break next week, Perry is now shifting players to make up for some who will be gone during the matches over the week. 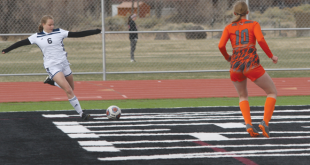 Fortunately, they can work on things in their match on Friday against Cripple Creek, a team the Titans typically take down each year. Then the struggle continues as they host both Sanford and Del Norte on Saturday, October 7 in Mt. Olympus. Matches start at 10 a.m.